Our team at Digitel are experienced with Commercial Automation Systems. We offer the complete range of Audio Visual Services including Background Music, Foreground Music, Conferencing Facilities, Projector Screens, Digital Signage, TV Screens and TV Systems. Contact us today for a security system quote or click to download your free brochure. We provide consultation & design, installation and maintenance of all Audio Visual and Automation Systems. This allows you the business owner to control all your Lights, Heating, Media Systems, CCTV, Access and Security Control all with the touch of a button. Our clients came to us having recently bought a building which they were turning into a Public House. 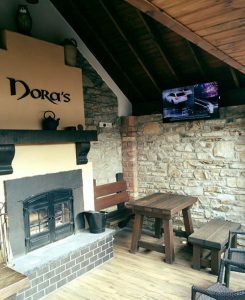 The clients wanted their premises to be a Traditional Irish Pub, whilst incorporating modern technologies so that their Bar was the go to place for Music and Sporting events. We initially received plans of the Bar to start putting a proposal in place and followed this by a site survey. After this we decided the best course of action was to divide the premises into 4 zones to incorporate the various areas internally and externally of the pub. There are now 7 discreetly installed High Definition (HD) Televisions, along with ceiling speakers on the premises, all in keeping with the traditional feel of the traditional Irish bar. This is in addition to 4 zones of music which allows the client to play different music in each zone dependent on their requirements on the day. All the equipment is concealed in an upstairs office neatly in a comms unit and the whole system and each zone can be easily controlled from behind the bar. The clients also have the added convenience of selecting music through a tablet or smart phone. Our clients came to us having recently purchased an existing hotel. They wanted to do a complete refurbishment of the Hotel to incorporate, Bedroom TV System, Complete new Bar, Overhaul of the reception area and full refurb of the Function Room. Having met with the clients on numerous occasions we ascertained that guests would require access in the Bedrooms to all the Irish & UK Television Channels, the bar would need to facilitate a Sound System and have the ability to screen sporting events, the reception area need to have a Sound System and the ability to control this easily. The function room in addition to weddings and music functions would also need to be able to accommodate conferences and meetings. We came up with a full comprehensive plan and worked at the premises for a month in the various areas to get the clients what they wanted. The Bar has 4 High Definition (HD) large screen Televisions installed which has made it the go to place for any of the sporting events being screened. There is also ceiling speakers throughout neatly and discreetly installed giving our clients top quality sound, from easy to use control systems behind the bar. The bedrooms now have a complete new multi-channel Digital TV system installed along with HD TV upgrades. The TV’s have Hotel Lock Feature which eliminates guests being able to untune the TV’s. This in turn eliminates our client’s requirements for call outs. The Function Room is fitted out with ceiling speakers, Radio Mic’s, Static Mic’s and a Full HD Projector System. This has left our clients in a position to be the go to place for conferences, functions and weddings. There are a further three zones in the hotel, Reception, Private Bar and Restaurant all of which have their own independently controlled sound system with ceiling speakers installed in each area. Our client came to us with a very specific brief. 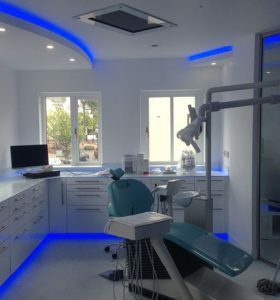 He as building a new Dental Surgery and wanted to make the process as comfortable and stress free for his clients as was possible. One way he wanted to do this was by introducing technologies into the surgery. The client wanted everything in the surgery to be streamlined, flush and very aesthetically pleasing. We installed High Definition (HD) TV in the waiting room, which has full access to Netflix for their clients. A first for us was to have a flush ceiling mounted TV above the patient’s chair, with full access to their favourite programmes, and again with Full Netflix access. This is certainly one way to keep a patient’s mind of the work being done!! Clement has carried out repair, tuning and connection work within the Aras Mhic Shuibhne Nursing Home on different occasions to the highest standards. We found him to be very reliable, honest and a trustworthy person and would have no difficulty recommending his work to others.